A UNCW-led grant team is collaborating with educators in Pakistan on a project called “Innovating and Designing Engaged Applications in STEM (IDEA-STEM).” The grant was funded through the U.S. Department of State with the goal of building STEM educational capacity in Pakistani middle schools. 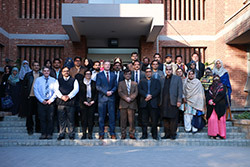 Over the course of several months, UNCW’s interdisciplinary team comprised of Bill Sterrett, Jess Boersma, Karl Ricanek, Chris Gordon, Suhail Sukhera and Mahnaz Moallem, collaborated with educators at the University of Education, Lahore in Pakistan. The work involved a review of Punjab curriculum and a focus on expanding knowledge and capacity in critical STEM areas including water and natural resource management through the use of hands-on projects, applications and Problem/Project Based Learning (PBL). In December, Sterrett, Gordon, Sukhera and Moallem traveled to Pakistan to provide a weeklong professional development workshop for middle grades educators in 20 middle schools. The program was designed to build teachers’ knowledge of STEM and PBL applications to enhance learning opportunities for students. The State-sponsored collaborative effort also provided laptops to ensure participating teachers had the technology needed to integrate PBL in their classrooms. Sterrett led planning and communication efforts for the educational exchange; Moallem and Gordon facilitated workshops on PBL and Squeak Etoys technology; Sukhera, who was born and raised in the Lahore area, helped facilitate cultural connections and assist with technology needs; and Boersma and Ricanek collaborated with integral coordination efforts from Wilmington during the trip. Sterrett is interim associate dean of teacher education and outreach at the Watson College and principal investigator on the grant. Boersma is associate dean of UNCW’s College of Arts and Sciences and director of Applied Learning. Ricanek is a professor in UNCWs Department of Computer Science. Moallem is a professor at Towson University and chair of the Department of Educational Technology and Literacy. Gordon graduated with a doctorate in Educational Leadership from UNCW’s Watson College in December, and Sukhera is a doctoral student at UNCW.